One of the most powerful features of Reel-Scout™ version 10 is the ability to run reports and gather statistical data that will drive improvements to your film office’s site and service offerings. The Statistics & Analytics Reports section of the Admin module allows you to view how your site is being employed, by whom, what the most popular searches are, and more. *The needs of every film office are different. If you require additional types of reports, contact our service team at support@reel-scout.com. Begin by entering the admin module. Click the appropriate icon on the main menu bar, as shown below. Click Reports in the Admin sub-menu. Selecting Reports will take you to the Statistics & Analytics Reports page. 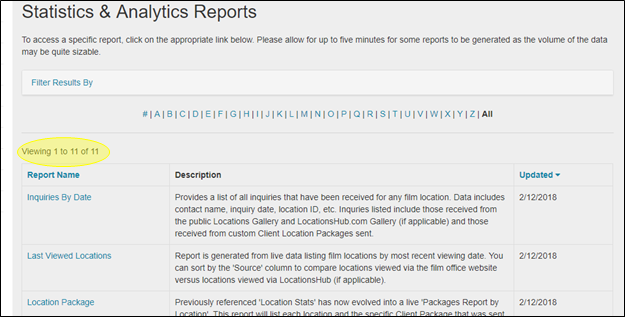 A list of available reports is viewable on the Statistics & Analytics Reports Page. By default, these reports are listed in alphabetical order. The number of reports displayed on your page and the total number of reports available can be seen in the upper left-hand portion of the screen. For additional pages, use the page change buttons located at the bottom of the page. You can also select the number of reports displayed per page here. There are three columns displayed on the Statistics & Analytics Reports page. The first column displays the Report Name. By clicking on Report Name, you can sort the list by numbered reports first, then by alphabetical order. Clicking the blue triangle beside the Report Name header allows you to reverse the order displayed. The Description column contains detailed explanations of each report type. The Updated column tells you the last date that each report was updated. You can sort reports in this column in either from most recent to earliest (or in reverse) by clicking Updated and toggling the blue triangle. You can search for reports based on the letter that they begin with by clicking a letter in “alpha” selection line. Selecting the number sign # will display reports that begin with a numeral. Clicking All will display all of the reports that are available. You can also filter the Statistics & Analytics Reports page to make it easier to find the report you are looking for. Clicking Filter Results By at the top of the page reveals search fields. You can enter either a Report Name or part of a Description. To download a report, simply click on the report name. A download will automatically be initiated in the proper format (such as Excel worksheet or PDF).